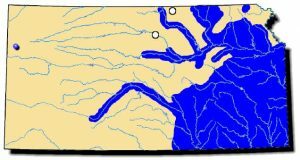 This species is distributed throughout the entire Mississippi River drainage from Lake Winnipeg-Nelson River system to western Ontario, the middle Great Lakes-St. Lawrence River system and tribtaries of Lake Michigan, Lake St. Clair, and Lake Erie; Pennsylvania west to Minnesota and Iowa south to Oklahoma and Louisiana, and in the Alabama River drainage. It also ranges west into Kansas and Nebraska. It is considered stable throughout its range. 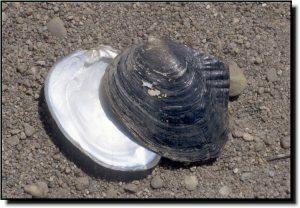 Comments: The white heelsplitter is a large flattened mussel shaped similar to a dinner plate with a flat, narrow-edged wing extending from the dorsal margin. As its name implies, this wing is so narrow-edged it could split your heel if you stepped on it with a bare foot. It has notable fine ridges on the umbo that resemble the number 3. Internally, this shell is entirely white with undeveloped lateral teeth that fail to interlock. This mussel is often found in the pools or slow runs of rivers, small perennial creeks and even reservoirs.